This scribble was published on Saturday, November 3rd, 2012. You can follow any banter on this scribble with the RSS 2.0 feed. You can share your inspired musings after typing the anti spam word near the bottom of the page. But no Pinging because its too naughty. 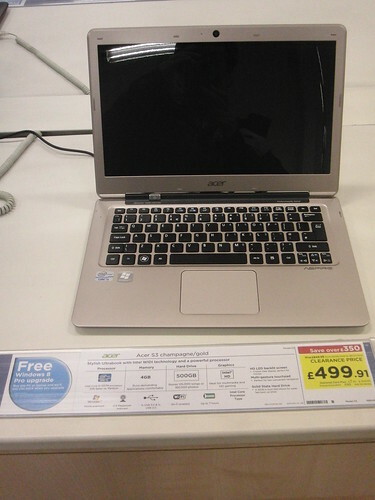 Looks like a nice machine, and a good price at £350 thanks to trade-in – I hope you enjoy it! The Windows 8 upgrade is surprisingly painless: assuming it came with Windows 7 on, you should find you download a tiny tool from Microsoft, fill in an online form (purchase date, details of the computer etc) and get a “coupon code” to claim your free upgrade with … a few gigabytes of downloading and a reboot or two later, you’re running Windows 8.